We have information you must know before you buy the Insight. The all-new 2019 Insight is in showrooms now. It ditches the Prius-like profile of its fuel-sipping predecessor in favor of a more familiar layout based on the Civic. With Honda holding back big discounts, the 2019 Insight's prices remain high at dealerships. This could change as we near Memorial Day, as Honda sometimes adds extra incentives around holidays. All offers listed here are available nationwide and expire April 30, 2019. The 2019 Honda Insight continues with its tiny $500 unadvertised incentive. Keep in mind that dealers are not required to pass these types of incentives on to you -- some keep them as extra profit. Shop around to find the best value. That said, recent college grads and members of the military can enjoy Honda's standard $500 bonus when taking out a loan or leasing through Honda Financial. The 2019 Insight has no financing specials yet. For reference, Civics are eligible for 2.9 percent APR for 36 months or 3.9 percent for 60 months in select areas. Unfortunately, the 2019 Insight has no advertised lease specials. Given the popularity of leasing, we expect to see deals soon. Your dealer can still help you with a lease, but odds are you'll get standard rates that will make the Insight a relatively pricey option. 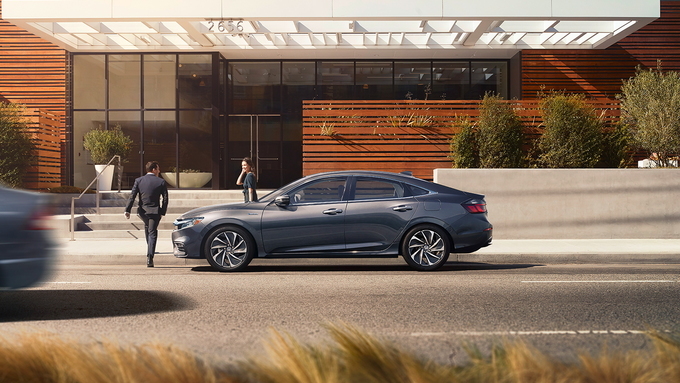 It has been said that “three is a charm,” and in the example of the 2019 Honda Insight, the all-new charm is certainly a bright one. 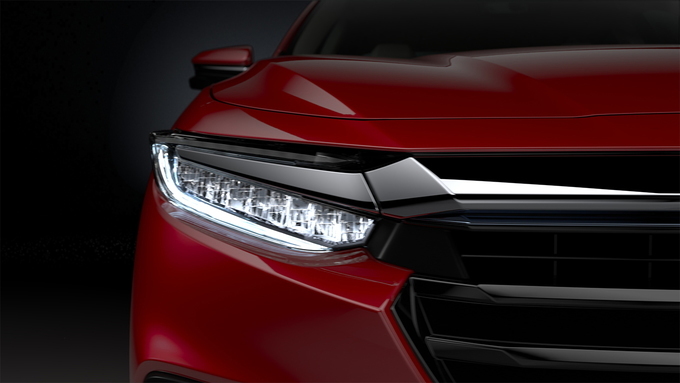 The 2019 Insight is larger than before with proportions rivaling the popular Honda Civic sedan. Roomy and efficient, the Honda Insight is a conventional hybrid with standard active safety features. 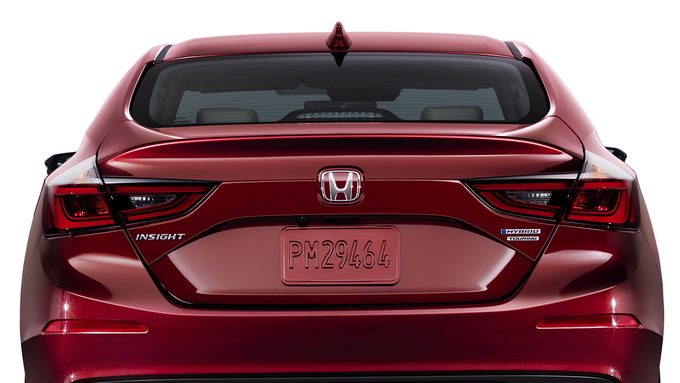 The 2019 Honda Insight is an all-new compact sedan, which launches the third generation of this venerable nameplate. The first-generation hybrid was offered from 2000 to 2006. The second-generation model rolled out in 2010 and lasted through 2014. The latest Insight features the third generation of Honda’s two-motor hybrid system. The original Insight was the first gasoline-electric hybrid available for the North American market, beating the Toyota Prius by six months. But the rest is history as the Prius line dominates the market. Powering the 2019 Honda Insight is a 1.5-liter four-cylinder gasoline engine with 107 horsepower and 99 pound-feet of torque. When combined with one of the two electric motors that work with the engine, total system performance is 151 hp and 197 lb-ft of torque. A second motor serves as a generator that powers the electric propulsion motor, recharges the 60-kilowatt lithium-ion battery, or both. This model makes an EPA-estimated 55 miles per gallon city, 49 mpg highway, and 52 mpg combined, which are outstanding numbers for a compact hybrid. Unlike most hybrid models, the Insight operates without a transmission. Instead, power turns the front wheels through an engine control unit that oversees the engine and the electric motors. The 2019 Insight is available in LX, EX, and Touring trims. Honda says the new model is “positioned and priced between Civic and Accord in Honda's passenger car lineup.” Yet, it's priced much closer to the Accord, but it begins about where we’d expect it to. 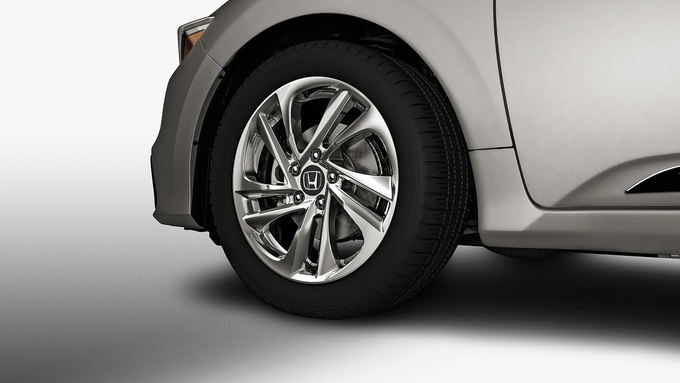 All models come with the Honda Sensing safety package. This suite of driver-assist features includes lane keeping assist, road departure mitigation, adaptive cruise control, automatic emergency braking, and traffic sign recognition. A rearview camera system is also standard. There are no other packages with the Insight, as each trim builds on the one before it, adding or improving features. The base LX coupe starts at $23,725 (all prices include the $895 destination fee). Standard exterior equipment includes automatic LED headlights, automatic high beam control, LED daytime running lights, LED taillights and brake lights, and 16-inch alloy wheels. Move inside and this model has full power accessories, a tilt-and-telescopic steering column, push-button start, cloth seats, air conditioning, a seven-inch color display, a rearview camera, and a six-speaker audio system with an audio jack, a USB port, and Bluetooth. Step up to the EX and your price comes in at $24,995. This trim builds on the base model and adds the Honda LaneWatch blind-spot monitoring system, HondaLink (WiFi hotspot, smartphone-enabled remote vehicle locking/unlocking and starting, stolen vehicle tracking, schedule vehicle maintenance), satellite radio, and HD Radio. The EX also brings in Apple CarPlay and Android Auto integration, an eight-speaker audio system, an eight-inch color display, and USB and auxiliary audio ports. Remote engine start is also included. The Insight Touring retails for $28,985. 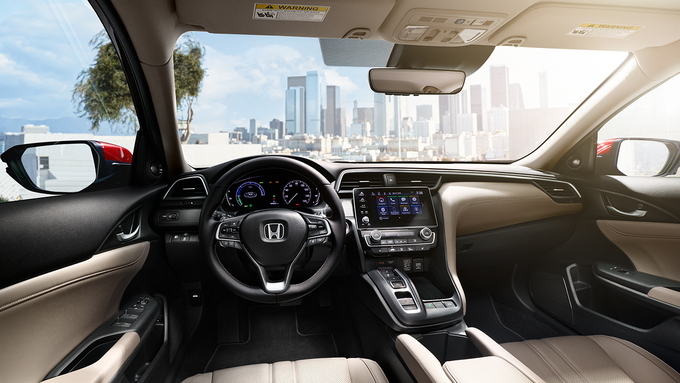 Honda includes LED fog lights, 17-inch alloy wheels, chrome door handles, chrome rear bumper trim, side mirrors with LED turn indicators, a moonroof, a 10-speaker premium audio system, leather-appointed seats, heated front seats with driver’s power adjustment, dual-zone climate control, and navigation. Fuel economy for the Insight Touring falls to 51/45/48 mpg (city/highway/combined), so the premium features come at a price. The base model for the 2019 Honda Insight has price appeal, but it lacks some of the tech features we expect in new cars today, including full smartphone integration. The EX trim is the logical place to shop as it resolves the tech problem and adds remote start and Honda LaneWatch. This time, we think Honda will stick with the Insight as it's built on the Civic’s 10th-generation architecture and has a style that’s no longer polarizing. In addition to stellar fuel economy, the all-new 2019 Honda Insight comes to market with a graceful design, roomy interior, and a wide range of advanced safety features. At the same time, Apple CarPlay and Android are missing from the base trim, the engine sounds raucous when pressed, and its sedan configuration lacks a hatchback's versatility. Insight pricing starts at $23,725 for the LX trim – about $2,400 cheaper than the hybridized Accord – and rises to $28,985 for the Touring model. But even the base LX is hardly a stripper as, in addition to the usual power bits, standard items include 16-inch alloy wheels, LED headlights, daytime running lights, taillights, and console lighting, automatic climate control, keyless push-button start, a five-inch LCD screen, a 160-watt, six-speaker audio system, Bluetooth, and the Honda Sensing suite of advanced safety features that includes a rearview camera, forward collision warning, automatic emergency braking, lane departure warning, and road departure mitigation. Our pick would be the mid-level EX, which adds noteworthy features like smart entry, an eight-inch color touchscreen, satellite radio, a 180-watt, eight-speaker audio system, Apple CarPlay and Android Auto functionality, Honda LaneWatch, and remote engine start. The loaded-up Touring is enticing, as it adds 17-inch alloy wheels, LED fog lights, side mirrors with LED turn indicators, rain-sensing wipers, leather seating (heated in front with a power driver's seat), a moonroof, a 450-watt audio system, navigation with real time traffic, dual-zone automatic climate control,, and an auto-dimming rearview mirror, but nudging a $30,000 sticker price makes it too dear for us to call it a value. If you measure performance in miles per gallon, the Insight is a real champ. With an EPA-estimated 55 miles per gallon city, 49 mpg highway, and 52 combined, the Insight is right in line with its arch-rival, the Toyota Prius. We managed to score a vehicle-measured 47.7 miles per gallon in some aggressive suburban driving. Credit for the impressive fuel economy goes to the 1.5-liter Atkinson-cycle four-cylinder coupled to dual electric motors. Total output for the hybrid system is 151 horsepower and 197 pound-feet of torque. Although hybrids are now commonplace, the setup on the Insight is rather unique compared to the gas/electric systems found on other hybrids – the biggest difference being the fact that Honda's "two-motor hybrid" system doesn't use a typical transmission. Instead, the Insight's system features a fixed gear ratio between both the gas engine and one of the electric motors. Under certain circumstances, the electric motor can directly drive the front wheels, while at higher speeds, the gas engine kicks in and all three clutch together to power the front wheels through a direct fixed-ratio drive. The system largely skips the need for a conventional transmission, relegating the gasoline engine to typically operate as an electric generator. For drivers, this amounts to an experience that's noticeably different in that acceleration and the gasoline engine aren't always directly proportional. In some instances, the gas engine is charging up the electric motor in a situation where you wouldn't expect it to be kicking in. On the other hand, there are situations where you'd expect the engine to contribute, but it doesn't. Both scenarios happen every now and then, though these idiosyncrasies should be hardly noticeable after a few months of ownership. Compared to other hybrids, the transmission-lacking Insight feels more responsive, with direct-drive offering a better burst of acceleration off the line, but with overall acceleration in line with other hybrids in the class, like the Prius. For the hypermiling crowd, the leisurely pace compared to conventional sedans of the same size shouldn't be an issue. The Insight rides atop a modified version of the Civic's underpinnings, inheriting that vehicle's top-shelf fluid-filled bushings, multi-link rear suspension, and, for the most part, its trademark ride and handling. Road imperfections are handled with ease, and the Insight remains relatively unperturbed over rutty pavement. The 16-inch wheels on base and EX trims with bigger sidewalls should have more give, but even the 17-inch wheels on our Touring tester offered a smooth ride. There's a decent amount of feedback through the steering wheel, and the brakes are easy to modulate – switching between friction and regenerative braking seamlessly – with excellent stopping power. At the same time, even with three levels of regenerative braking (operated by the steering wheel-mounted paddle shifters), the Insight still lacks one-pedal driving capability. Additionally, passing requires some advanced planning, especially on back roads, while the engine can sound raucous and unrefined when really pressed. The latest Insight comes to market with a slick, sophisticated design that not only puts the Civic's boy racer styling to shame, but also integrates seamlessly into the brand's lineup. The roofline and 103.7-inch wheelbase may be borrowed from the Civic, but, mercifully, both fascias take their design cues from the Accord. It all starts up front with an aggressive grille and narrow, elongated headlight enclosures, both topped by a wide, bright, chrome brow. Body sculpting is tamer, with graceful wheel arches and fewer creases along the flanks. In back, wide taillights wrap around the upper rear portions of the quarter panels, tapering down when they reach the trunk lid. Above the taillights, a trunk lid with a built-in spoiler marks the termination of the steeply-raked roofline. Overall, the Insight's understated, familial design is much more approachable than the old models were, and we're sure the handsome new look will make it a legitimate contender against the bizarre-looking Prius. The slick body is wrapped around an interior that's logically laid out and boasts of quality materials. There's great outward visibility all around, comfortable seats, and an intuitive infotainment system shared with the Accord. The four drive-by-wire transmission buttons are all shaped and angled differently, allowing you to select the correct one simply by feel. There's ample room both up front and in back for four adults, 15.3 cubic feet of cargo space in the trunk, and a rear seat back that folds on a 60/40 split with a pass-through large enough to accommodate a 52cm road bike without having to remove its front wheel. At the same time, the base model lacks the 60/40-split folding rear seat, the sedan body isn't as versatile as a hatchback, and, despite very good active noise cancellation, some road and tire noise makes its way into the cabin – especially over rough pavement. The efficiency, the new buttoned-up styling, the room, and comfort make the Insight an enticing option. However, the unique powertrain's odd sensations take some getting used to, and there's also the value question: the Accord Hybrid is almost as efficient, larger, and also more powerful at just a $1,260 premium over the Insight EX. Those who like the idea of the Prius but can't stand what it looks like would be perfect for the new, elegant-looking Insight. If you're looking for a car with a little more of the old Honda zing behind the wheel, spend your time shopping the Civic or Accord, as the Insight features the most watered-down driving experience of the three. The 2019 Honda Insight marks a turning point for the nameplate. Before, the funky-looking hatchback was an ugly rebel without a cause, and, as a result, it was kicked to the curb by the Prius' popularity. Now, though, Honda's finally learned that best way to tackle Toyota's avant-garde hybrid is offering the Insight with a more approachable design – a move that comes just as the Prius takes a swan dive off the deep end of the styling pool. Considering the overall excellence and aesthetics of the new Insight, Team Prius suddenly has a reason to be worried. We have partnered with trusted dealers in your area to give you a great price on the new Honda Insight.